I'm going to be sheathing the TNT I'm building and was wondering if there was a good way to come up with a nice consistent radius on the shears? I take the boards I will be using for the shears and chines and prop them up on one end to see how evenly they sag, or bend. Swapping ends and/or turning them over can influence this. Pick boards that have a matching sag. If you are resawing your wood, booked boards often evenly bend. Attaching the shears and chines to the stem and breast hook and then bend back to the frames will give a more rounded bend. Attaching them to the frames and bending to the stem and breast hook will give you a flatter bend. Often building room dictates how you will be able to bend the longitudinals. I had to adjust the bend of one of my sheers after it was glued. So the lesson there is to get them clamped in place and take a close look at them before you glue them in place. Hi guys, thanks for your responses. I'm sorry that my question wasn't very clear but you've just given good info on something i hadn't even thought about. A very big thank you! I was actually curious about when I get to the point of fiberglass sheathing the hull if there was a good way to get a consistent radius on the sheers to eliminate the sharp edge where the deck and side planking meet so that the glass cloth could wrap around and not lift? With the constantly changing curvatures I can't see using a router persay unless there's a trick to using a router to do it? I cut up one of my wife's credit cards to make a gauge . Then used a belt sander. Haha, thanks Bill, I was thinking that making a gauge and doing it by hand might be about the only way to do it. Using the wife's card is just a bonus. She'll get over it eventually........right? Hi Chugalug. Saying that has gotten me thinking of maybe finding or making a piece of molding like 5-6" long with a groove the right radius and glue sandpaper in the groove? 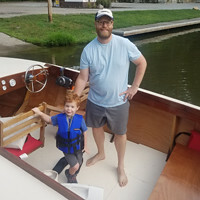 Sounds good.maybe even screw on some kind of handle to make it a little easier.Your little boat should be a little easier than my Bo-Jest was. .......and another one for the specialty tool box! Thanks for the help Chugalug. I picked the TNT for that exact reason. Even with all the changes I'm making to turn it into a "squirt boat" I would think it'll be quite a bit easier than a Bo Jest. My reason for choosing it for my first of a few (hopefully) boats I plan to build. It's been a lot of enjoyment going through the planning, drafting and now into the parts gathering stages and now I'm getting ready for the wood splinters! !